A review of Sikh Religion, Culture and Ethnicity edited by Christopher Shackle, Gurharpal Singh, and Arvind-Pal Mandair (Curzon Press; December 15, 2000; pp. 220; $115). The events of the 1980s generated a good deal of academic interest in Punjab and the Sikh community. It was not only in India that a large volume of social scientific literature was produced on the 'crisis' in the region, in the Western academia also Sikh/Punjab studies came to be recognised as a distinct area of inquiry. Perhaps the most significant aspect of the new academic interest in Sikh studies in the West has been the active role being played by the diasporic Sikhs. The volume being reviewed here grew out of a workshop organised by its authors in the School of Oriental and African Studies (S.O.A.S. ), London, in 1998. As suggested in the title of the book, the volume covers three dimensions of Sikh studies - religion, culture and ethnicity. With the exception of one, all contributors belong to the new generation of Sikh academics living in the West. While their being there is undoubtedly an important factor, the scope of their scholarship goes much beyond their immediate existential concerns. The first four papers in the volume focus primarily on Sikh religious thought. The common strand in all of them is that they challenge the established theories on Sikhism in the western academia and offer fresh interpretations of the Sikh religion, philosophy and history. Similarly, the arguments presented in the papers on Sikh culture and ethnicity too have much broader implications for the prevailing notions on the subject. Intervening in the debate on the question of canon formation in Sikh tradition and the contentious issue of the history of the Sikh holy scripture, Adi Granth, Gurinder Singh Mann presents an interesting thesis. Contrary to the traditional belief that the Adi Granth was compiled by the fifth Guru in 'one great act of creativity,' Mann argues that there was 'impressive evidence to support the view that the compilation of the Sikh scripture began with Guru Nanak himself.' However, the Sikh scripture has been through a long process of evolution and this process of evolution, Mann claims, continues even today. The new technologies of printing and communication as also the growing diversification of the Sikh community, for example, have influenced this process in different ways. Papers by Arvind-pal Singh Mandair and Balbinder Bhogal deal with the philosophical problems of interpretations of the Sikh religious text and the significance of some important events in Sikh history. In a well argued paper, Mandair questions emphatically what he calls 'the rules of engagement' with Sikh religion. He challenges the mainstream assumption that a proper representation of religion in the academia necessarily has to be through an objectivist history. The so-called secular scholarship on religion, Mandair argues, was not entirely free from metaphysical and transcendental premises. Through a critique of McLeod's writings on Sikh religion, he tries to show that the difference between the modern/analytical history and the traditional/popular history of religious beliefs was not that of one being scientific and true while the other being mythical and false. The difference between the two, he claims, is merely that of attitude. Balbinder Bhogal's paper 'on the hermeneutics of Sikh thought and praxis' too deals with the questions of interpreting Sikh texts. However, Bhogal's context is more specific. His primary interest is in working out a method that could approach Sikh scriptures from the vantage point of the diaspora. In other words, his concern is 'how can the second or third generation of diasporic Sikhs understand the Adi Granth.' Quite like Mandair, he too argues that instead of looking at the religious text through 'an external methodology validated by 'science,' we needed to look for the Guru's own clues about how to interpret the Word (shabad). The two papers respectively by Christopher Shackle and Nikki Guninder Kaur Singh deal with aspects of Sikh culture. Shackle looks at the sources that have gone into the making of the Punjabi literary history. Apart from the influence of the writings of the Sikh Gurus, Shackle underlines the critical role of the Sufi poets in the making of the Punjabi language and literature and that of Urdu which provided models of literary style to the modern practitioners of Punjabi literature. Nikki Guninder Kaur Singh's paper is a study of the Sikh character in Michael Ondaatje's novel (which was also made into a movie) 'The English Patient.' Apart from her elegant style of writing, her paper also has several interesting strands. In the process of re-interpreting the character of Kip (Kirpal Singh) as a post-modern subject, she provides us with an exposition of the Sikh way of life and the significance of different symbols of Sikh culture. 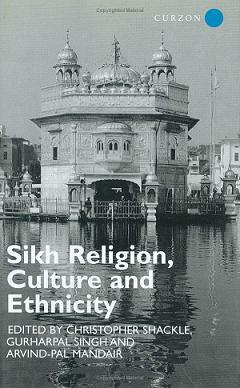 Of the three papers on Sikh ethnicity, the one by Gurharpal Singh is undoubtedly the most provocative and stimulating. He argues that despite the powerful mobilisations by India's minorities, particularly those located in the peripheral regions, the question of ethnicity has not yet been taken up as a serious subject of inquiry in India. This, according to Singh, has been because of the continued dominance of Nehruvian generation of scholars and what he calls the conventional wisdom on the nature of cultural unity and diversity in the post-independent India. The predominant tendency in this mode of thinking has been to undermine the political significance of the ethnic movements. The most obvious problem with the 'conventional wisdom,' according to Singh, is that it is ahistorical. It ignores the foundational event of modern Indian state, partition, and tends to project India as a unique and exceptional case. Against this dominant view of the nature of the Indian state, Singh argues that India should be seen as an 'ethnic democracy' in which Hinduism works as a meta-ethnicity and in which hegemonic control is exercised over ethnic minorities, particularly those living in the peripheral regions. Singh's argument is obviously provocative and requires a serious engagement, which is obviously beyond the scope of this review. However, one must add here that though the so-called 'conventional wisdom' was certainly dominant for quite some time in India, its influence has considerably declined during the past decade. There are several social scientists working in India, who have raised similar questions about the nature of Indian state and who recognise the significance of ethnic movements and of other identity movements, as has been done by Singh in his essay. Darshan Tatla's paper on the narratives of nationhood and homeland in the Sikh diaspora offers a comprehensive account of the history and politics of the Sikhs living in the Western countries, particularly those in Britain, Canada and the U.S.A. The central concern of his paper is on the mobilisation among them during the post-1984 period - after Operation Bluestar. Though the Sikhs living abroad did imagine Punjab to be their homeland, they also had no problem in identifying themselves with India as the country of their origin until 1984. However, the events in Punjab during the 1980s resulted in their alienation from the Indian nation and they began to look towards Punjab as their homeland, a potential nation. According to Tatla, this was not merely a change in their attitude towards India or Punjab, but it also led to a fundamental change in the manner in which they imagined themselves as a community. The last paper by Harjot Oberoi, written as a personal account of his experiences during the anti-Sikh riots in Delhi in November, 1984, and later with the advocates of Khalistan in Canada, does not really fit well into the overall theme of the volume. While the other papers explore different dimensions of the Sikh culture and ethnicity, his is a critique of nationalist movements without making any distinctions of contexts and locations. On the whole, one can say that the publication of this volume is an important achievement for Sikh studies. Apart from the passion that the contributors share for the subject, their writings also show that for them the question of understanding different dimensions of Sikhism was not merely an academic exercise, but also a search for their own selves.